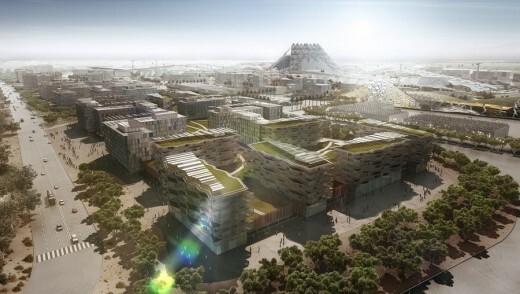 Abu Dhabi, May 27, 2010 – The Higher Colleges of Technology (HCT) signed an agreement with Studio Daniel Libeskind and Siemens AG to collaborate on the design and building of “Innovation City” – a state-of-the-art academic and technological hub which will be the future home to Abu Dhabi Men’s College, CERT, and HCTs Central Services division. HCT students will benefit by learning from the design process of HCT Innovation City and the technologies, materials and methods employed in the design and construction process will be used for ongoing learning and research purposes. “We are honored to have the opportunity to make a cultural and educational contribution to an institution as great as the Higher Colleges of Technology. The proposed project establishes Innovation City as an integrated HUB for education using state-of-the-art facilities to create a cultural center for the arts and sciences. Its form, inspired by the flight of the Falcon, symbolizes the original spirit of the country and will become a cultural landmark in Abu Dhabi. Sustainability is at the heart of the form, substance and function of the entire project.” says Daniel Libeskind. “This is a very exciting development for the future of HCT students and it will enable them to learn in some of the best facilities in the world. We are very pleased to be partnering with Siemens AG and Studio Daniel Libeskind – two talented and internationally recognized organizations – to create this magnificent education and research facility in Abu Dhabi,” continued Dr Kamali. Studio Daniel Libeskind’s other university projects include the Creative Media Center for the City University of Hong Kong (scheduled for completion this summer), the London Metropolitan University Graduate Center, and the campus master plan and research center for Leuphana University in Germany. Siemens, as the technology partner of choice, will contribute to the project with solutions that add more value and efficiency in buildings through sustainable technology. Siemens will integrate sub-systems of latest technologies such as building automation and security systems, smart grid, students and faculty processes, e-Learning, connectivity, and potential green energy generation.